According to my research, the “five golden rings” mentioned in this verse do not refer to jewelry. 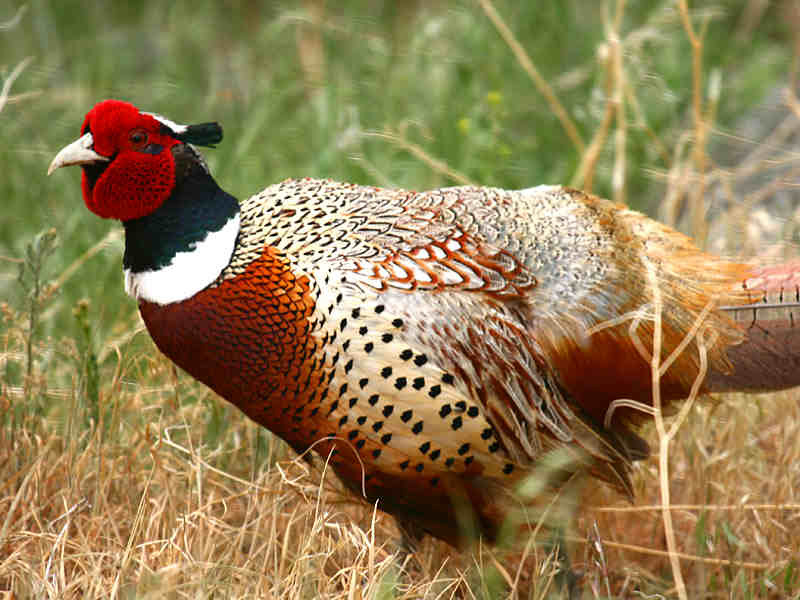 Rather, they are a reference to yet another bird – the ring-necked pheasant. One can clearly see that there is a lot of feasting on fowl in this song. I’ve always loved onion rings. Oftentimes when given a choice I would choose them as my side dish with my burger, rather than the more commonly served french fries. Of course, I prefer the ones that are made from scratch – the onions sliced right there in the kitchen into multiple rings of varying sizes, battered or breaded, and fried to a golden brown. Let’s face it…those pre-made frozen ones just don’t cut it. 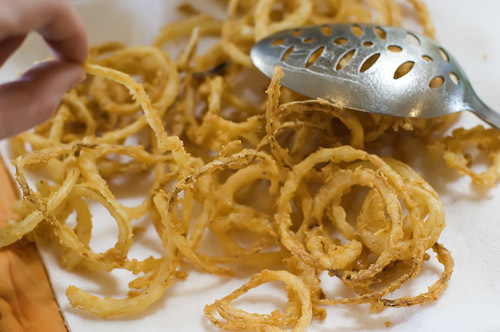 They will do in a pinch, but there’s nothing like a true home-made onion ring. And considering that they really don’t take that much time or trouble to make, there’s really no excuse for not making your own. It is interesting to note that for such a simple dish, there are a variety of ways to make these things. Some folks make a beer batter, others prefer a batter made from buttermilk. There are the people who cut their onions into thick slices, and others who prefer a thinner ring. Some chefs dip their rings in bread crumbs, others into corn meal. 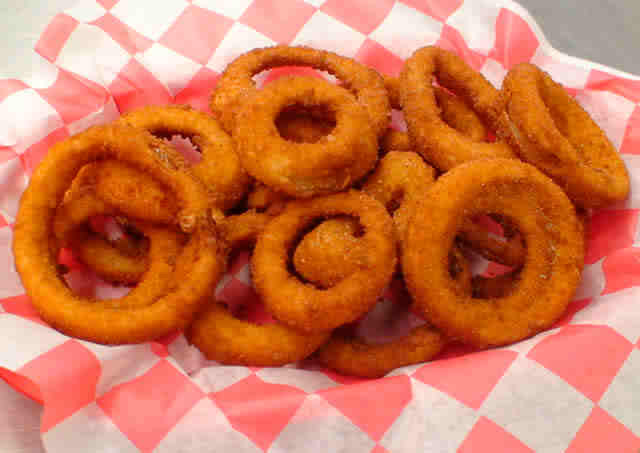 There’s even those who bake their onion rings rather than fry them, claiming they are healthier that way. Myself…I prefer my onion rings cut thin and dipped in flour, and then fried crisp. Some folks might consider them to be more like “onion straws” than rings, but since they are still round, they meet the definition here. 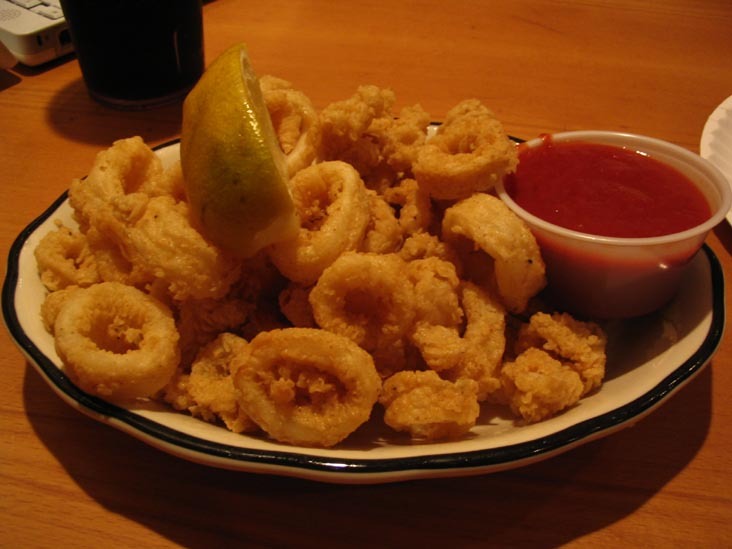 From onion rings we move on to another ringed food – fried calamari. I’ve always been a seafood lover. While lobster is my top favorite, I also like shrimp, crab, clams…and calamari. Calamari, a dish in Mediterranean cuisine, is fried squid. 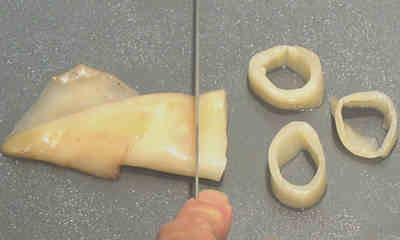 It’s prepared much like onion rings are – the squid is cut into rings, breaded, and quickly deep fried to prevent the rubbery toughness that can occur otherwise. It’s often served with lemon wedges, and a variety of different sauces – commonly marinara, cocktail, or tartar sauce. Fried Calamari and Onion Rings…the Fifth Day’s version of fish and chips. Enjoy, and may all your Yuletide celebrations be golden!